The Heat Pump - it is usually installed in the utility room and mostly out of sight. The pipes - They are laid underground next to the property. Depending on the type of system, you will require anywhere from a under a third of an acre to over an acre of land to lay the pipes. A typical installation can be completed in about three days. 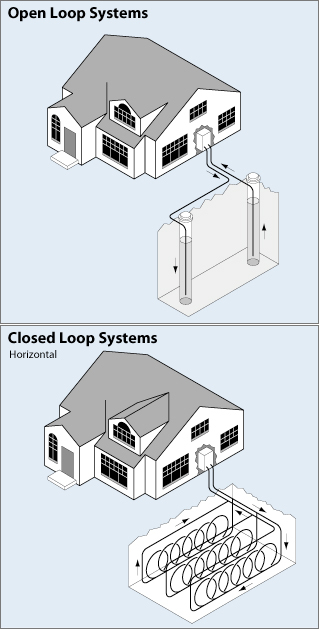 Open Loop System: These systems are generally installed in locations that have access to underground water source, such as a well. The system is linked to a well casting and draw water from there to circulate throughout the system as a heat source. Installation of open loop system is generally cheaper to install than closed loop systems. On the downside, they tend to use a lot of water. Closed Loop System: This is the most common type of installation and the loops can be installed either horizontally or vertically. In a horizontal installation, a loop of pipes is installed 3-8 feet underground. While this is most cost effective option, it requires more land to lay the network of pipes. A typical home will require between 1,200 and 2,000 feet long loop of pipes. In a vertical installation, a smaller loop of pipes is laid deep into the ground (typically between 150-500 feet deep). It's a more expensive system to install, but may be more suitable for properties with less available land or if the ground freezes for extensive periods during the year. The operating costs of open loop and closed loop systems are similar. No matter what type of geothermal heating system you install, though, you will be getting an excellent and inexpensive home comfort solution that will keep your indoor temperature at the right level all year round. Geothermal heat pumps are durable and require little maintenance. The heat pumps carry a warranty of 5-10 years, while the underground pipes carry a warranty of 50 years. Ground Source Geothermal systems are relatively easy to maintain and require minimal maintenance. Have fewer mechanical components than other systems and most of the components are installed underground, thus protecting them from extreme weather . The components inside the house are small and easily accessible for maintenance. Have one of the lowest relative operating and maintenance costs of any HVAC system available. Maintenance and service are easy and do not require specialized training, giving the owner more options for maintaining and servicing their equipment.